In the 1840s, Kierkegaard rejected Hegel’s historical dialectic narrative, instead he stressed that each individual must negotiate his or her own relationship with God. Kierkegaard also objected to Hegel’s claim that there was system of thought that could explain the whole of reality. Rather, Kierkegaard considered that the truth is based on the subject and one’s own resolute decision. As a result, Postmodernism denies the subject and sees everything as culturally constructed. Finally, the Postmodernist Lyotard denies any vestige of a grand narrative of history or ideology started with Hegel . The essay To be Connected to Eyn: living in a Postmodern World is itself constructed from parts of three talks (2000, 2002, 2008) and one can see a progression from his confrontation with Postmodernism, his postmodern reading of Hasidism, and his moving beyond. In this section we find his most explicit definitions. On basic definitions of postmodernism, see here, here, and here. For Rav Shagar, Postmodernity is not theoretical philosophy but a condition of life, we live with a sense of the end of the narratives. It is not even a description of society, it is how we feel and it is expressed by Lyotard’s Postmodern Condition. We live after all ideologies of Communism, Socialism, and Nazism. For some readers, this applies also to Zionism and Halakhacism. In the Postmodern age, we especially experience a loss of self. “In Postmodernity it is not the [loss of the] creator of the world (God) but also of man, a process that starts with denial of God and concludes with the breakdown and death of the subject.” There is what Shagar calls a “Nietzschian loss of the value of man”. Shagar explains the philosophy of Kant as subjectivism and perspectivism (AB- this is not Kant, he is reading Kant through Nietzsche, in that the latter connects everything to his philosophy of will). Kant critiqued metaphysics and now in the modern era we can only save truth, ethics, and God by relying on subject which leads to Nietzsche’s concept of the will, all ethics are based on the will. Shagar cites Foucault in that all is a will to power, but the will has no hierarchy and it is not the cosmic blind will of Schopenhauer. Rather today, we are in a social weave in which all discourse is power “unidirectional power” – with no metaphysical angle. Shagar’s Foucault has no discussion of freedom, critique, discourse, and stratagem. This discussion is difficult because the philosophers are more namedropped into the text than cited and analyzed; he works in a Hasidic manner by making equations of terms. Shagar says that all is language and not metaphysics, which he proves by mentioning Wittgenstein Derrida, and Lacan. He discusses Wittgenstein’s limits of language and limits of questions that can be asked. Shagar reads Wittgenstein not as the peak of analytic linguistic thought but as Postmodern. The mistake is widespread in Israel. I should check the introductions to the Hebrew editions to find the source. Shagar also mentions the critics of global capitalism and late capitalism, to which he states that we have Rav Nachman’s critique of capitalism. He also notes that technology has changed everything about all lives. 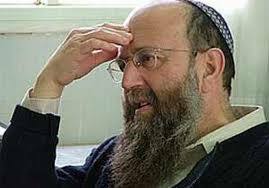 Rav Shagar asks: what is the Archimedical point of the Postmodern era? What deep insight does it express? For Rav Shagar, it reveals the Hasidic concept of metaphysical nothingness, eyn. It is an age of no metaphysics above, no ideology below; it is a pantheistic Postmodernity. In the Postmodernist age, there is no why. For Rav Shagar, this is neither Heidegger’s nothing nor the mystical nothing, nor is it even the Buddhist nothing. This is nothing with a small “n” as opposed to a capital one. An attitude of no direction as described by Gadi Taub in his work, Dispirited Rebellion. This is the loss of the creator, a loss of any great ideology, a loss of man, of truth; this loss is the source of the fantastic perspective which characterizes the Postmodern world. Rav Shagar then compares this condition to Existentialism and (Bahye). Where Existentialism sees no reason for life and is compelled therefore to ask Why not commit suicide, Bahye in his Duties of the Heart sees no purpose in material life so we therefore relinquish everything to serving God (bitachon 7; also see Kuzari III who rejects this opinion). These are both forms of histavut, equanimity or indifference. The difference is that Bahye sees redemption in the light of God and in an influx of chesed. For him, it brings not only tranquility but also ecstatic love and cleaving to God. In contrast, Existentialism denies any form of redemption and destroys a sense of existence in which life as empty of meaning. An Existentialist sees the Hasid as empty and as a hindrance to self-acceptance. The Postmodernist, according to Shagar, outdoes the Existentialist by relinquishing truth and the need for truth. This giving up on truth yields self-acceptance But he also relinquishes a need to make a big deal or about the giving up of truth. A postmodern Hasid is therefore giving himself up to an ecstasy not of truth but of infinite self. Since in the postmodern age there is no more metaphysics then the reaching of Eyn is really reaching our infinite selves. Rav Shagar already said similar things in the last paragraphs of the first essay in his earlier work Kelim Shevurim. God is our own infinite selves. Continuing this line of thought, for Rav Shagar Postmodern equanimity (histavut) can be explained by the two Chabad concepts of sovev kol almin and mimalei kol almin. Sovev surrounds and has no hierarchy, no good or bad, no sense of absolute just that the world is only God –all is his will Postmodern negation is sovev kol almin: nothing is absolute by itself, there is no up and down or hierarchy. But, a person cannot live on the level of surrounding sovev rather we need to live in mimale kol almin. Sovev leads to nihilism and the breaking of categories but it can also have a positive function in opening up to new options and new places to find God. It places us in a world where God is hidden and without hierarchy. If we do not know where God is, then we can use our free will to find the way. Shagar sees this as similar to Bahye who chose to seek God in a material world devoid of God. For Rav Shagar, using the terms from the language of kabbalah and Hasidut allows us to see that postmodernism reveals the Eyn –the Eyn od. He conflates the Infinite of God, the absence of God and the all-encompassing of God. In truth for Rav Shagar, there is no grasping of the metaphysics above. We have to accept that God is the ground of everything and all our choices. A note should be made of his use of Hasidic language, it is not a translation of Hasidut into Postmodernity or vice-versa, rather a few theologically pregnant Hasidic terms that he uses to create a concrete that is original to him. Postmodernists do not turn look to their struggles into fear or joy because they believe it is all contingent or happenstance. Question: Can you bind yourself to Eyn in a way similar to the way a traditional religious Jew can bind himself to the Holy One blessed be He for religious devotion? Answer: No, one cannot. And one cannot experience the resolution offered by religion anymore, no fear or rejoicing. Question: Will we not we be officially left with nothing and therefore create a closure defined by absence? Answer: Hard Postmodernism is Nihilism and deconstruction of the subject. It denies truth. Soft Postmodernism, however, is a mixture of traditions, what works for me, I do not know what the truth is, there is no possibility of knowing truth but it does not deny truth itself. In soft Postmodernism, all is based on the perspective and context of person but truth does exist. (AB- The only people who use this soft/hard distinction are Emergent Evangelicals who use postmodernism to says that there is no certain truth in the world and therefore we turn to Christianity, but the Christianity is uncertain about doctrine and teachings). Question: How can this perspective change society without possessing truth? Answer: The paradox of the void/absence (halal panui) allows us to confront the lack of truth without running from it or hiding, it instills an attitude of humility not victory. The paradox of Postmodernism is that if everything is in doubt and there are no true values then does this not lead to the questioning of postmodernism since we cannot know that it is true. Such a question is “nonsense” in the Wittgensteinian sense. Wittgenstein’s nonsense is a form of Eyn. (AB- in Wittgenstein’s writings, the word “nonsense” carries a special technical meaning which differs significantly from the normal use of the word. In this sense, “nonsense” does not refer to meaningless gibberish, but rather to the lack of sense in the linguistic context of sense and reference. In this context, logical tautologies, and purely mathematical propositions may be regarded as “nonsense” Why do these Israelis misread Wittgenstein so horribly?! The very question shows that Shagar is treating postmodernism as an ism to adopt rather than the current condition of our lives like the prior existential-psychological era that we did not choice but were embedded within). But if Postmodernism is another uncertain narrative then even postmodernism is yeshut (an entity or grand narrative). In fact this makes it a pure yeshut, which in Hasidut makes it the evil of Amalek. The acceptance of postmodernism is thus Amalek. However, soft Postmodernism lets you not even accept the theory without accepting it as the truth. Yes, we are in doubt even about Postmodernism – just give up foundations and accept that you will never know. We will live with the existential irony of holding opposites. The difference between the two types of Postmodernism is dependent on separating the connection between random and indifferent. Hard postmodernism says the randomness leads to indifference. Soft postmodernism says that randomness does not lead to indifference because there is meaning above the self, even if we cannot know it. We give up the need for truth and even question Postmodernism. There is ecstasy when you realize that you can live as Eyn because then you know that you are living life fully without the limits that binds others. In that state of living, one is above the limits of science, historicity, or psychology or any other structure that impedes the believer and his belief. Eyn opens him up to humility and greater spirituality. In conclusion, we wind up with the irony and freedom of the religious Existentialists, like Zorba the Greek—or do we? We also get the freedom to see everything as Eyn and not worry about belief in God, the rationality of religion, religious rules, or social roles. We have the absence of God, the self as God and the full language of Hasidut. But whereas Art Green’s Hasidism leaves us in the modern world of doubt, and a postmodern would treat God as culturally conditioned (or textual or a God beyond God), here we have a self that accept itself and its fragmented life. To sort out where Rav Shagar differs from Existentialism, we return to Kierkegaard: “Without risk, there is no faith. Faith is precisely the contradiction between the infinite passion of the individual’s inwardness and the objective uncertainty. If I am capable of grasping God’s objectivity, I do not believe. If I wish to preserve myself in faith I must constantly be intent upon holding fast the objective uncertainty […] still preserving my faith.” For Rav Shagar, after his reading of Nietzsche, Lyotard, and Rav Nahman, there is no quest for passionate faith because we have made peace with the contradictions and uncertainties. This peace and uncertainty is our ecstatic freedom. Appendix: Already on Facebook, Todd Berman commented that in a way that shows that his readers may really just be looking for a pluralist modernity. Kuhn and Berlin are pluralist moderns and not postmoderns. Can only tell you what works for me. The notion that the corollary to the impossibility of Truth is the lack of necessity of arriving at Truth is very powerful for me. I was quite taken by Isaiah Berlin’s article on History where he argues that history is more akin to art in that it jibes with one’s understand of the world. Then Thomas Kuhn questioning the absolutes of science or more accurately the bias of scientists skews their models of the world, Rav Shagar, for me, seems to be the first person to take such notions and argue for a synthesis within my world view. Can one study artificial intelligence, read Asimov, Biblical criticism, like the Mets, and find a way to work this into a holistic view or why learning Bava Metzia is important as well? The founding of the modern secular State of Israel posed a dilemma for Religious Zionist leadership because the state operated outside of the realm of Rabbinic law. The state had neither Sanhedrin nor a Talmudic legal system. In addition, the daily operation of a state posed many conflicts to the state-less diaspora halakhic tradition. How does Jewish law now accept democracy of elected officials that now includes non-religious, non-Jews, and women? How does one produce electricity or load docks on the Sabbath? In the early years of the state, a variety of rabbis engaged in a still unfinished and unfinishable project of creating a Torah state in Israel. (For more information, see Asher Cohen, The Tallit and the Flag: Religious Zionism and the Vision of the Torah State in the Early Years of the State (Jerusalem: Ben Zvi Institute, 1998). Even as many still pin for those fragmentary projects, in recent decades the site of tension has been the required army service, a source of pride for the religious Zionist community especially their entering higher command positions. Yet, does one’s have to obey orders that go against one’s religious beliefs? What if orders go against one’s Zionist political beliefs? What are the limits of bending the laws of prayer, Sabbath, or modesty? To answer these questions of the tension of military service and religion there is a recent book by Elisheva Rosman-Stollman (Professor of Political Studies at Bar-Ilan University)For God and Country? 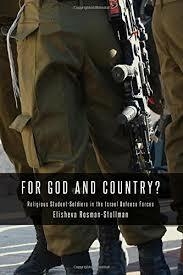 : Religious Student-Soldiers in the Israel Defense Forces (University of Texas Press, 2014). Many journalists and scholars in Israel are suspicious of the student-soldiers who participate in these programs, but in fact, as Rosman’s research demonstrates, the pre-service study programs serve as mediating structures between the demands of Religious Zionism and the demands of the Israel Defense Forces and do not encourage their students to disobey orders… Rosman has discovered that the pre-service study programs can successfully serve as agents of civil society, both able to curb the military’s efforts to meddle in civilian affairs and vice versa. Rosman prefaces her book by stating that: “Most non-Hebrew speakers are largely ignorant of the civil military issues” She presents the issues for the English speaking reader by looking at the mehinot, the shiluv programs as well as the hesder programs. Currently, more attend the former two programs than the latter one, even if hesder is better known in the US.. She also looks at the women’s programs, the new Garin program. Traditionally, Yeshiva was an educational ideal, but can army service override it? The Haredi approach says no, it cannot override it except temporarily at best. But for many Religious Zionists army service a religious command like tefillin, while for others it is a needed practicality, or they feel that they are engaged in a continuous obligatory war, and for other it is bearing one’s burden and not standing idly by the blood of your neighbor. Rosman did discover that mechinah and shiluv programs report fewer religious problems, while hesder participants find greater dissidence. The best parts of the book are based on her extensive interviews In which we see the important roles played by Rabbis Eyal Krim, Ohad Tahar-Lev, Rafi Peretz, Avi Ronztki and Eli Kahan in creating a Religious Zionist approach that closes the gaps between army and religion. 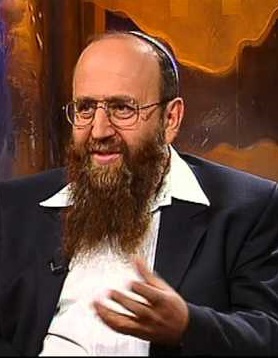 One of the heroes of the book is Rabbi Eli Sadan, who is seen by many as the father of mechinot, who wrote a pamphlet in 2005 stating that religious soldiers should not disobey orders because it would undermine the entire military and he sent it to all active relgious soldiers. Recently and beyond the scope of the book, Sadan called on soldiers to remain in the room when women sing during ceremonies and published sharp criticism against the “price tag” phenomenon. For more on him, see here and here. Sadan also recently put out three ideological pamphlets on the direction that Religious Zionism should take. As a political scientist, Rosman was more interested in society than ideas; her goal is to understand the function of the mechinot not to analyze the books. For example, she shows that the students of Har Etzion, Petah Tikvah, Yerucham, Ma’aleh Adumin are given a clear signal of where the institution stands compared to other institutions that leave the students in ambiguity. Her question was solely the clarity of the message not it’s content. Nevertheless for the student of Jewish thought, her framework and bibliography provides ample guidance in knowing who to read. 1} What is the thesis of your book? Pre-service religious programs mediate between religious student-soldiers, the IDF and their social group (religious zionism). When they are successful, these programs are able to regulate pressures and help all the parties involved coexist in a way that is mutually beneficial. In addition, these programs serve as agents of civilianization of the military (As opposed to militarization of civil society) and in certain ways, strengthen civil society in Israel. Peter Berger and Richard John Neuhaus wrote a book about mediating institutions that stand between individuals and the larger institutions of society, such as family, neighborhood, voluntary associations. But also the mafia, gangs, the KKK can all be mediating institutions. These institutions allow individuals to understand the larger constructs of society, give the state legitimacy and allow individuals to voice their needs and wants better. My book looks at all the pre-service comprehensive programs: hesder, mekhinot, shiluv and the midrashot that serve this role in Israel between the religion and the state. In the context of the book, mediation is the attempt to stand between individuals and greater structures they belong to and regulate conflicting demands and pressures. It is a strategy that can be used – or not – by individuals in order to navigate between these larger structures. The tensions between religion and the military include specific mitzvot such as how to observe shabbat, and sometimes how to observe kashrut. Observing prayer properly (minyan, torah reading during the week and on shabbat). How does one live in the same quarters 24/7 with non-religious individuals. If one is supposed to study torah during the ages of 18 and 24 (for men), then how does can one also serve in the military during this time? 2) How do the study programs help? Study programs can serve as mediators by conducting negotiation on behalf of individuals either with the IDF or with religious systems. for example during the disengagement, some of the programs helped students by supporting them actively, some helped by negotiating with the IDF so that the students were less involved. Rabbis and books alone do not have this function. Study programs can help individual student-soldiers with religious problems by giving halakhic advice, reassuring students, advising on how to navigate situations when dealing with specific situations or problems. They can also mediate on a more general level: trying to help women soldiers project a halakhically-sound public image, trying to support students during the disengagement or in co-ed issues students find problematic. In general the study programs serve mostly as a sort of “safety net” – students know that if they really need an advocate, the program will be there for them. In many cases, just the knowledge that this is possible is enough. Sometimes it isnt. 3) What did you learn from your interviews? Any religious soldier in the IDF (and in other militaries) will tell you that he or she had to negotiate. The book is looking at the concept of religious soldiers and the potential issues this concept raises from the perspective of the individuals themselves: what do religious Jewish Israeli soldiers contend with and how do they handle potential conflict? In that sense, I think the book is doing something new. It puts the individual soldiers in context. It looks at the mediators themselves, and the super-structures, but the focus is the soldiers. We usually talk ABOUT them, but don’t listen TO them. The book tries to listen to them, to their mediators and to the IDF. It tries to let them do the talking, rather than talk “over their heads”, as happens quite a bit in academic and journalistic discourse regarding this topic. When I teach this topic, students usually come up with lots of examples for negotiation – not just in this field. Discussion usually reaches the point that people wish there were more options for mediation in order to make sense of our public and private lives, but even more so in order to help us deal with structures we don’t understand, don’t know how to navigate, don’t want to navigate alone, and so on. We usually feel powerless or at a disadvantage when we deal with super-structures. In the context of the book, soldiers are perceived as part of the system, but they are individuals with needs that should be addressed. This is not just for the benefit of the soldiers, but also for the benefit of the military system and the religious system. Having a mediator can be helpful to all actors in this context. I met with students once a year for at least 3 years. So I got an opportunity to watch them change over their service. I got to see them grow up in many aspects. I had good and bad experiences with army personnel. Rabbi Sadan refused to meet but agreed to a phone interview. He wouldn’t let me come visit the mekhinah either, we had ground rules for interviewing his students (it didn’t affect what I did in the end, but it was a clear message from him about how he felt about the project). 4) Why is co-ed the most sensitive issue? This has a lot to do with Israeli society today, I think, as well as the fact that issues of tzniut are in a way more clear-cut halakhically. On the one hand, in general we see a tendency to emphasize tzniut in Israel today. Gender scholars in Israel, such as Orna Sasson-Levy (such as in: “Gender Segregation or Women’s Exclusion? – The Military as a Case Study.” Civil–Military Relations in Israel: Essays in Honor of Stuart A. Cohen (2014): 147-169. ), have written about this. And so you have demands to separate buses, not to display women’s photos in the public sphere and so on. Naturally, in Israeli reality, these things spill over into the IDF. On the other hand, while issues of disobeying orders for example are harder to muster halakhic support for, co-ed issues are a relatively easy target. I think it is harder for rabbis to be lenient when considering tzniut. In this context, I accept Charles Liebman’s thesis on extremism that all religious systems tend toward their extremist positions and extremism is the norm. It is far harder to explain religious moderation than extremism. Extremists rarely feel the need to apologize and usually blame the moderates for not being “truly” religious. I think this idea makes it easier to understand why the issue of mixed service has become the focal point for religious issues. It is moderation that needs to be explained. So if a rabbi takes a lenient stance on modesty, it is much harder for him to defend his position if he were to take the more stringent one. Its always easier to say “its prohibited”. Moderate rabbis are suspect. Looking at it from a different perspective, there are a few points regarding co-ed service that I didn’t discuss in the book: Asher Cohen has spoken a lot about the effect extremists have on the mainstream (for a latest example in English: Cohen, Asher, and Bernard Susser. “The Extreme Case Syndrome in Religion-Army Relationships.” Civil–Military Relations in Israel: Essays in Honor of Stuart A. Cohen (2014): 127-146). Most religious soldiers do not conform to stringent standards of Tzniut in their daily lives when not in uniform. However, when in uniform, they are affected by the minority calling for a more stringent position on modesty and may cave in to this position for many reasons. Another point to consider is that most religious soldiers do not encounter women during their service. Contrary to what some other civil-military scholars in Israel posit, women and religious men rarely compete for the same military positions. The overwhelming majority of religious men serve in combat positions – few women serve in semi-combat positions in the IDF. So in truth, the majority of religious men in uniform meet women in the initial stages of training (if at all) as instructors. Some do serve with women either in combat support positions or non-combat positions. But they are by far a minority. 5) How are you agreeing or differing with the journalist Amos Harel who also writes about this tension of religion and army? Amos Harel is a journalist at Haaretz who usually covers military affairs. Harel’s latest book, in Hebrew (the title was translated as: The Face of the New IDF), paints a portrait of the IDF in the 21st century using a single unit (Its a good book – I liked it). I was able to interview soldiers from many units, so its difficult to compare. Harel’s stance in his coverage of similar issues is usually that religion in the ranks is not a positive thing. Religion should not be part of the IDF. I’m trying to put things in context and show that it is much more complex than usually presented. Not “good” or “bad”. But, I’m not sure we’re even trying to do something similar. Religion can be a negative force. But it can also be a positive one – like anything else. When people go out to battle, or when they are serving their country in other ways, it is not uncommon to feel the need to turn to a higher power. For some people this is religion and it helps them be better soldiers. Not just to be brave, but it can also mean to be more moral. More humane. If a soldier thinks that religiously he is prohibited from behaving violently toward a prisoner of war, then religion can be a positive force. There are many other examples, and if you look at halakhic responsa (shootim) from the past decade or so, you can see examples for positive and negative influences of religion on troops. A lot depends on who is doing the asking and who is doing the responding, halakhically. 6) You compare the Israeli situation to Iran in terms of religious aura and to Turkey regarding practical issues. Can you explain? Islam and Judaism have a lot in common. So comparing Israel to Muslim countries is important and not done enough, i think. Of course Iran and Turkey are not the same as the Israeli case, but there is a good basis for comparison since we are dealing with religions that are law-based (or orthoprax). Additionally, all three cases are conscription-based militaries, so we might assume we would find similar structures. But we dont. And I think that the main reason we see differences has to do with boundaries and therefore also with mediation. The Iranian military doenst accept a secular reality. It is a religious Muslim force. So it has no use for mediation. Mediation would only weaken the religious establishment. The Turkish military is apprehensive about anything to do with religion because it sees itself as a secular force – even though its soldiers are mostly Muslim, if mostly culturally so. This means it also rejects mediation. I think that perhaps if there was a possibility for mediation, the Turkish armed forces could manage religious soldiers and their needs better. In that respect, Turkey and Israel mirror each other. Since they are both conscription-based (for rank and file soldiers), they MUST include religious soldiers and so will have to contend with the dilemmas these soldiers bring with them: prayers, fasting, dietary requirements, dress and so on. In Turkey, these soldiers are basically ignored, but the problems exist. In Israel there are mediators, but – as I show in the book – they dont completely solve every problem. They are, however, better at managing tensions. 6) Does observance erode in the army? In general, we can talk about processes. During the harder parts of service (mainly training), most of my interviewees felt there was a certain erosion in observance. However, as they progressed and entered other stages of service, this usually changed. Interestingly, quite a few interviewees felt that their level of observance actually increased. Their service made them more committed to their religious identity. Of all my interviewees, only two became secular during service, and even they weren’t entirely sure that this was a final identity change and refused to truly classify themselves. I do note that my study did not focus on this point and I cant draw definitive conclusions as to secularization during service. 7) What makes the Gariinim program special? The Garin program is a program geared to help religious women who would like to serve in the IDF but want two requirements met. First, they don’t want to serve in a military position that will be difficult for them religiously. Second, they would like to learn torah as well. These women can enlist through the garin and combine study with service in an environment that is more friendly for religious women (such as service as education NCOs). This is really the first time you have official programs with a halakhic “umbrella” that endorse women’s conscription. Actually, this is one of the projects I am working on now. I think that the garinim mark an important turning point in the way Israeli society in general and Religious Zionism in particular view religious women in uniform. Religious women always served, but they were basically ignored by the religious establishment. In some places, enlisting meant you werent a “good religious girl”. 20 years ago, 12th graders in certain schools, who knew they were going to enlist rather than go to National Service, did their best to conceal this from their school so as not to hurt their sisters’ chances of getting in. The garinim didnt change this overnight, but they demonstrated how it was entirely possible to be a “good religious girl” and still serve. That is huge. I won’t say that today being a religious women in uniform is considered accepted or a norm or a “good” thing, but it certainly isnt what it used to be and the garinim played a very important part in that. 8) You read through dozens of ideological tracts, seforim, and little books written by Rabbis for the students. Which do you recommend for readers to gain a sense of the ideological issues? It really depends on what you are looking for. For readers who want something practical – how to guides, if you will – the books written by rabbis in mekhinot (such as LeEzrat Hashem BaGiborim) and Rabbi Yosef-Tzi Rimon’s (a rabbi who teaches at Har Eztion) booklets are good choices. These are basically “how to” books – either practical (how to keep up a positive attitude in the face of difficult and trying military realities, how to find ways to uphold morality or stick to one’s ideals even when others around are slacking off, wasting time and so on) or halakhic (for example – what to do with one’s tfilin if one is leaving the base on Shabbat for a combat situation and will not be back before Sunday morning. Is it permissible to take the tfilin with, in order to be able to use them on Sunday, even though it is prohibited to carry them on Shabbat? During prayer in the field, when it is difficult for cohanim to remove their shoes, can they perform “aliya la-duhan” with shoes? Are there halakhic rules for guard duty? [yes – there are. For example, it is forbidden to be late for your shift as being late means stealing time from the soldier you are relieving; which is prohibited by halakha]. Is it permissible to count non-religious soldiers for a minyan? Or – one of the most common dilemmas encountered by religious soldiers: is it permissible to eat “food that traveled”? – food that was brought to the military base or outpost on Shabbat, violating the eruv.). They are small, army-pocket-sized books that can be very helpful for a religious soldier in daily military life. Personally, I find almost anything written by Rabbi Eli Sadan, one of the heads of the mekhina in Elie, fascinating. I think he is perhaps one of the least understood rabbis to those who are not his students. Everyone thinks they know what he says, but don’t bother to read him.I think if people really want to understand what the mekhinot are about ideologically, his writings are pivotal. I think its a shame some rabbis and leaders do not publish more – Rabbi David Bigman of the Religious Kibbutz, Ms. Tami Biton of the Be’er program and Rabbi Ohad Tehar-Lev of the Hadas program, are just a few examples. They have a lot to say, but few hear them since they only speak to their students. It creates a reality where only certain voices are heard and this naturally influences discourse on the topic. For example, all three of these figures speak of a “thinking halakha”, where a true Torah scholar is ready to ask questions, even without receiving answers, and is willing to face the modern, secular world, and learn from it. Tami Biton has a clear social agenda that she wants to instill in her students. Rabbi Ohad (as his students call him) feels that “if military service is a mitzva, then it’s a mitzva for everyone”, both women and men. His students are taught that their observance of halakha is important and meaningful and that the fact that they are women does not detract from this. Rabbi Bigman’s students all stress that military service is not a positive thing. It is a civil duty that should be carried out well, but certainly not something to be looked forward to. In his classes and talks, he emphasizes that a Torah scholar must be sensitive to the world he lives in. During one of our talks he told me how much he was impressed, as a teen growing up in the United States, by the famous picture of Rabbi Heschel marching with Martin Luther King Jr. These voices are not as prominent in public discourse and rarely heard when discussing religious soldiers in the IDF. I think the most interesting part of this project, for me, was meeting rabbis and students, various officers, women who are important to the changes in civil-military relations in this sphere. Most of these people dont have much of a public voice, but they are extremely influential and have something to say that is worth listening to. What I should really do is just publish the interviews. It would be more interesting than this book. The historian of Jewish philosophy Isaac Husik once mentioned that Jewish thought is a series of footnotes to Maimonides. In this he was modifying the famous statement of philosopher Alfred North Whitehead who claimed that philosophy was a series of footnotes to Plato. In his recent book Maimonides and the Shaping of the Jewish Canon, James A. Diamond the Joseph and Wolf Lebovic Chair of Jewish Studies at the University of Waterloo accepts the veracity of Husik’s claim by looking at many Jewish thinkers and their dialectic relationship with Maimonides. James A. Diamond has earned an LLB as well as an LLM in International Legal Studies at New York University School of Law and has practicing civil litigation, in addition he has an MA and PhD in Medieval Jewish Thought from University of Toronto. 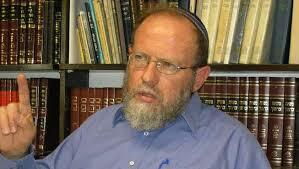 He was the international director of the Friedberg Genizah Project. His prior two books were Maimonides and the Hermeneutics of Concealment, and Converts, Heretics, and Lepers: Maimonides and the Outsider, both smart and insightful. Professor Isidore Twersky considered Jewish intellectual life as revolving around the usage, rejection, or struggling with Maimonides issues. His approach asked how each later thinkers answered the broad cultural issues by which Maimonides had struggled, including the role of aggadah, the role of meta-halakhic knowledge, the role of elitism, and the role of spiritualization of Judaism. James Diamond in his Maimonides and the Shaping of the Jewish Canon is concerned more with the actual dialectics of subsequent thinkers with the philosophy of the Guide than the cultural world. He looks at points in the thought of Nahmanides, Ritva, Ran, Abarbanel, Spinoza, Netziv, Buber, Rav Kook, and Hermann Cohen among others to see the canon of Jewish thought as shaped by Maimonides. Readers may profit from comparing this interview to our interview with Kenneth Hart Green about Maimonides. 1. How is Maimonides a “fulcrum” of all subsequent Jewish thought? Maimonides set the agenda in one way or another for virtually all of Jewish thought since the Middle Ages; a study of the explicit and implicit Maimonidean threads that course their way through various historical periods and thinkers serves to illuminate certain aspects of the different strands of that thought which might otherwise go undetected. Much of Jewish intellectual history can be viewed as a series of engagements, disengagements, and re-engagements with him, fueled by the kind of writing Maimonides himself practiced, thereby establishing the very lines of discourse that target or conjure up his thought, regardless of the social, cultural, and intellectual transformations inevitably wrought by time. A few years ago, during the book’s gestation, Leon Wieseltier suggested looking at Gershom Scholem as a contrast. For Scholem there were only three books–the Hebrew Bible, the Zohar, and the collected works of Kafka–which he “read and reread with true attentiveness, with an open heart, and with spiritual tension.” He considered these three “books” to be “collections on which over the course of three thousand years were impressed that spirit customarily referred to as the spirit of Judaism.” Scholem’s concise list of quintessentially Jewish works betrays a certain bias against the classical rabbinic tradition, Maimonides, and rationalism. I would express the same sentiment with respect to the collected works of Maimonides. Alongside the Bible, the Talmud, and the Zohar, they comprise the core spiritual and intellectual canon of Judaism. It would be difficult to characterize anything postdating the Middle Ages as authentically Jewish absent some engagement with all or some of the components of this canon. Indeed, Scholem’s own canon of Jewish thought, and lifelong interest in kabbalah, can be thought to have been constructed in one sense as a reaction to Maimonides. When reminiscing about what motivated his study of kabbalah, he admitted an antipathy to the Maimonidean (along with Saadya Gaon and Hermann Cohen) project, whose “primary function” he claims was “setting up antitheses to myth and pantheism and disproving them. It would have been more beneficial had they attempted to raise them to a higher level within which they would be negated.” Scholem’s entire kabbalistic project can be viewed as a redemption of what Maimonides had denigrated. The numerous examples of Maimonidean engagements in the book collectively amount to an argument against Scholem in favor of elevating the Maimonidean oeuvre to canonical status alongside the Hebrew Bible, the Talmud, and subsequently the Zohar. Moshe Halbertal’s distinction between central texts that are influential in shaping thought and formative texts “in which progress in the field is made through interpretation of the text itself,” is instructive in terms of how precisely to classify the Maimonidean textual legacy in terms of Judaism’s curricular canon. In light of the extent to which this book places post Maimonidean thought in dialogue with that legacy, Maimonides’ Guide and Code can safely be subsumed within the formative category. This study gives voice to that dialogue in a panoply of intellectual languages and across historically delineated periods. The dialogue may stretch between a rabbinic rationalist such as Maimonides, living in Islamic-dominated Egypt; an adversarial rabbinic mystical exegete such as Nahmanides (13th century) in Christian-dominated Spain; the fiercely antagonistic fifteenth-century kabbalistic encyclopedist Meir ibn Gabbai; or an admiring twentieth-century Eastern European mystic, Zionist, and political activist such as Abraham Isaac Kook, who reinvented Maimonides; but all are firmly entrenched within a well-established rabbinic tradition. Even Spinoza, Judaism’s arch-heretic and free-thinking iconoclast, who broke with the Jewish tradition altogether in seventeenth-century Holland, could not sever his ties to his inherited religion without refuting the Maimonidean biblical hermeneutic. In his very rejection of Maimonides, he actually resorts to this hermeneutic if only to overcome his primary Jewish intellectual predecessor and foil. In a sense Maimonides emerges as a fulcrum for Jewish law and civilization in all its genres–legal, rabbinic, philosophical, and mystical. Often, even when Maimonides is not explicitly mentioned, it becomes evident from a cited verse or a rabbinic adage that a later thinker has contemplated Maimonides’ interpretation, whether as endorsement and incorporation of its Maimonidean sense, or to carve out new space for an opposing idea. 2. Do you agree with Isaac Husik, the historian of Jewish thought,who considered Jewish thought as a series of footnotes to Maimonides? I have been studying Maimonides in various contexts during the course of my life from the yeshivah, through a legal career, and then in the academy. My interests, however, range the entire spectrum of Jewish thought across strictly delineated historical borders the academy has drawn, at times artificially, between medieval, early modern, and modern. At the same time, I have wandered, some might consider trespassed, onto “fields” that also seem to me often artificially constructed when it comes to Jewish thought such as theology, philosophy, law, rabbinics, and biblical exegesis. Maimonides seemed to be a connective thread traversing historical periods and genres of writing. Every path in Jewish thought and law from the twelfth century onward bears some of Maimonides’ imprint, even the particular crystallization of kabbalah, so inimical to the general thrust of his rationalism, would have been unimaginable without the work of Maimonides. The Husik quote which launches the book transposes what Whitehead is reported to have said regarding all of western philosophy as a series of footnotes on Plato, to the relationship between Jewish philosophy and Maimonides. This always resonated with me and is an apt, yet partial, characterization. Husik’s observation was actually too narrow in its scope, and emerges from the traditional strict bifurcation between philosophy and theology. I would expand Husik’s observation beyond philosophy to include theology, law, and kabbalah. As scholars such as Isadore Twersky have argued, the Mishneh Torah offers a grand jurisprudential/philosophical/ political/ social conception of Judaism and humanity in general. It begins with a universal ideal accessible intellectually to all human beings and ends with a messianic vision where that universal ideal is actually realized socially, politically, and philosophically. An entire “parochial” legal code is bracketed by a universal vision. The Guide is also far more than a philosophical treatise. I begin my book with another observation, this time by Leo Strauss, that it “is not a philosophic book–a book written by a philosopher for philosophers–but a Jewish book: a book written by a Jew for Jews.” When I first began my studies on Maimonides, I thought it a trite observation. However, over the years, I came to increasingly appreciate its full import. Overlaying the Guide’s undercurrent of Aristotelian philosophy, medieval cosmology, and logic, is a very Jewish work. Its relentless citation of biblical and rabbinic sources renders it much more a book of exegesis than strictly a philosophical treatise. The Guide I believe , in its entirety, fits in to the age old tradition of rereading Judaism’s sacred texts both on a micro-level of individual words and a macro-level of passages or units called “parables”. Maimonides’ intended audience is Jewish; his core subject matter consists exclusively of philosophical issues filtered through Jewish texts; the very writing of the Guide is grounded in a halakhic dispensation of openly transmitting forbidden esoteric subjects ; and the existential angst he aims at relieving of the conflict between the Torah and philosophy is a Jewish one. 3. How does Harold Bloom help developing your approach of tracing the use of Maimonides? There is a form of anxiety that both links and propels the various strands of Jewish thought presented in the book and helps to account for a critical dimension of creativity in advancing Jewish thought. Harold Bloom’s seminal insights into the vitality of poetry and prose are relevant to the way the book approaches the history of Jewish thought vis-à-vis Maimonides. Poetic Influence–when it involves two strong, authentic poets–always proceeds by a misreading of the prior poet, an act of creative correction that is actually and necessarily a misinterpretation. The history of fruitful poetic influence, which is to say the main traditions of Western poetry since the Renaissance, is a history of anxiety and self-saving caricature of distortion, of perverse, willful revisionism without which modern poetry as such could not exist. Jewish philosophical, jurisprudential, and theological influence–when it involves a strong, authentic thinker—often proceeds by a misreading of Maimonides, an act of creative correction that is actually and necessarily a misinterpretation. A good part of the history of fruitful Jewish philosophical and theological influence, since the Middle Ages, is a history of anxiety and self-saving caricature of distortion, of perverse, willful revisionism of Maimonidean thought, without which modern Jewish thought as such could not exist. To borrow another formulation from Harold Bloom’s theory of poetry, one of the indicators of the greatness of the thinkers dealt with in the book lies not necessarily in their “originality” but rather in their “persistence to wrestle with their strong precursors, even to death. Weaker talents idealize; figures of capable imagination appropriate for themselves.” That “precursor” with whom the subjects of the book wrestled and from whom they appropriated is Moses Maimonides. 4. In your view, what is the dialectic between philosophy and kabbalah? I don’t believe there can be a neat bifurcation between kabbalah and philosophy and the Maimonidean impetus for the development of kabbalistic theology is a critical focal point to demonstrate this. Scholars of Jewish mysticism have already argued for the Maimonidean influence on kabbalah- and not simply as an antagonist but as a positive catalyst for kabbalah’s formation. Maimonides’ influence on the Zohar is still a scholarly desideratum but I deal with one particular example where the Zohar’s mystical/sefirotic exegesis of a key verse in Maimonidean hermeneutics is fueled by Maimonides’ own pragmatic, rationalist reading of it. Two chapters in the book deal specifically with the dialectic between philosophy and kabbalah using Meir ibn Gabbai of the sixteenth century and Rabbi Abraham Isaac Kook of the twentieth as instructive examples. Ibn Gabbai’s magnum opus, Avodat HaQodesh, consists of a counter-lexicon which methodically displaces the philosophical layer of many of the key terms such as “sitting,” “standing,” “foot,” or “spirit,” dealt with in Maimonides’ lexicography of biblical terms in the first part of the Guide, replacing them with his own parallel, but inverse, lexicon. While Maimonides’ overarching concern was to drain these terms of their anthropomorphic connotations when referring to God, ibn Gabbai’s was to reverse Maimonides’ anti-anthropomorphism crusade, and re-anthropomorphize biblical language in aid of what he was convinced was its kabbalistic message. Along the way ibn Gabbai dismantles Maimonides’ theological rationalism. His exegesis of biblical verses and midrashic traditions are intended as hermeneutical counterpoints to Maimonides, radically transforming the philosophically esoteric exegeses of those common references into a kabbalistic mode. Throughout his prolific career, R. Kook, engaged the thought of Maimonides, whose own corpus, in its thoroughly systematic nature, whether halakhic or philosophic, could not be more antithetical to R. Kook’s. Rather than Gabbai’s counterpoint, R. Kook rereads Maimonides through commentary- more of an eisegetical reinforcement of his own thought than an objective commentary. In a sense R. Kook applied the methodology he ascribed to Maimonides’ appropriation of Aristotelian philosophy to his very own appropriation of Maimonidean philosophy. He believed that the patent sense of many Maimonidean texts offends their real, authorially intended, sense and therefore required conscious subversion so that the genuine sense would emerge seamlessly for his readers. R. Kook reads Maimonides “omnisignificantly”, a term James Kugel applies to rabbinic midrashic readings of scripture. In R. Kook the lines between Jewish mysticism and Jewish rationalism become somewhat blurred. R. Kook, in this short commentary on the most philosophically oriented section of Maimonides’ Mishneh Torah, combines the two domains seamlessly in constructing an intellectualist mysticism for which Maimonides’ rationalist corpus is indispensable. 5. Should we consider Abarbanel to be a continuation or rejection of Maimonides? I focused in particular on Maimonides’ thought which was imported by those who succeeded him, adapted to new currents of thought, subverted, or negated by them, as the case may be, and transported further, elongating the chain of Jewish philosophy, theology, and law. A number of thinkers I deal, such as Isaac Abarbanel, Moses Nahmanides, Ritva, and, I even include Spinoza, suffer from a not uncommon love/hate attitude toward Maimonides. They all share a dynamic emotional/intellectual/spiritual relationship that reflects both a reverence for Maimonides’ towering intellect and rabbinic proficiency as well as fear and anxiety as to the consequences of his rationalism. I chose his treatment of the akedah as a particularly poignant example of Abarbanel’s passionately conflicted engagement with Maimonides which treads a precarious tight-walk between what Abarbanel perceives as both a continuum and a rupture with rabbinic Judaism and loyalty to halakha. In this case, an apparent endorsement of Maimonidean biblical exegesis rendered in the course of his own exegetical discourse may actually amount to a sustained subversive attack once his overall interpretation is considered. Abarbanel’s cultural/historical milieu, which demanded concrete existential sacrifice for the preservation of one’s faith along with the disappointing failure to withstand a challenge to faith in his own family background and beyond in the general community, may have informed his exegetical divergence in this instance and throughout. Thus biblical exegesis in fifteenth-century Iberia charts a different path, fueled by a worship that in the end entails absolute submission rather than Maimonidean reasoned obeisance to divine command. Abarbanel’s exegesis has its precedent in the withering assaults on Maimonidean rationalism by Moses Nahmanides, a seminal critic of Maimonides, especially when it comes to offering rationale for mitzvoth. The subsequent struggle to carve out a space for Maimonidean theology is so intense that a major attempt to do so emerges within the Nahmanidean camp itself by Ritva who dedicates a systematic treatise to it. What I argue is that while Nahmanides attempted to replace a rationalist theology with a more kabbalistic one, a generation later Ritva, salvages Maimonidean rationalism and reserves a space for it alongside kabbalah within Jewish practice and belief. 6. How does the Netziv fit into your pattern? 7. Why is Maimonides relevant today? Firstly, he remains relevant in the sense for example the Hebrew Bible does. I constantly remind my students that regardless of one’s beliefs, one cannot possibly understand the history of Western thought, culture, and art without knowledge of the Bible. In the same way, from practical, historical, and scholarly perspectives my book demonstrates that the development of Jewish thought since the middle ages, in all its dimensions, cannot possibly be appreciated without considering the traces of Maimonides’ thought explicitly and implicitly. For this, the correctness of his science is irrelevant. My book ends with Franz Kafka, a Jewish writer who is rarely mentioned in the same breath, and I claim that even his Kafkaesque thought can be better appreciated if read against the grain of Maimonides. Secondly, and more importantly, is that Maimonides stands as the supreme model of a complete human being, who struggled to incorporate both his humanness and his Jewishness into a seamless whole. As such both the world of the yeshivah and that of the academy have much to learn from his legacy. Again, the science Maimonides operated with is irrelevant to an appreciation of the existential enterprise he devoted his life to. The science changes but the dilemma, conflict, and spiritual wrestling remains the same. The reason he has and continues to wield so strong an attraction in both worlds is because of his wholeness, of his potent combination of rabbinic expertise and philosophical acumen. Without those Maimonides could easily have been ignored by devotees of either school and thus would not loom as large over the evolution of Jewish thought, nor indeed, even be the subject of my study. For me the problem he addresses that motivated him to compose the Guide really says it all about his continuing relevance to any modern Jew. Those who seek to remain committed to their tradition and sacred texts as well as their intellects need not abandon either. Jewishness cannot be fulfilled at the expense of turning one’s back on one’s intellect and living a lie, condemned to perpetually suffer from “loss to oneself and harm to one’s religion”. Maimonides offered us the tools for avoiding a life of inauthenticity or simplicity. Religion for Maimonides does not provide comfort but demands extraordinary effort in understanding both the world around you and the why of God’s dictates. Blind faith attracts no praise from Maimonides, except as a childish starting point for a life of sustained thought and struggle as the only authentic mode of existence. 8. Where does Maimonides stand along the classical rabbinic canon that preceded him? In whatever sense the term “ dread” or “awesome” is understood, the notion is that the Bible undergoes an interpretive process through the various stages and approaches represented by these different rabbinic genres that slowly moderates that initial terror, transforming it into understanding and clarity. I would venture to attribute the dread emanating from the Bible to its inability to communicate sensibly with a later audience that might no longer share its theological tenets and is uncomfortable with its moral and juristic sensibility. Inconsistency and anachronism, as well as large parts of it being rendered irrelevant by the historical demise of the sacrificial cult, obscures its communicative “face” even further. What initially overwhelms, startles, or shocks is illuminated by the conciliating, liberal, and explanatory strategies of rabbinic exegesis. My book seeks to add a fifth face, that of Maimonides to that exegetical process which filters out further biblical unintelligibility for an even later audience who can no longer tolerate its philosophical, theological, and juridic incoherence. Just as the biblical Moses intervenes to mediate the divine face-to-face communication that people cannot tolerate further, so the medieval Moses intervenes in Jewish intellectual history with a new midrashic face that philosophizes and theologizes. In doing so, Jewish thought continues to advance while at the same time firmly anchored in its foundational texts.